Second time is the charm! The Evil Within was a game that showed a lot promise but unfortunately was also a game that ultimately failed to deliver that much needed boost that the genre badly needed. Good survival horror games are few and far in between and given that Resident Evil 7 was considered to be a successful return to form, fans of this franchise hoped for the same success. Launching on Friday the 13th proved to be a lucky charm for Tango Gameworks and Bethesda as The Evil Within 2 proved to be a big leap from the first game across all categories. Check out our review of The Evil Within 2! Starting off with a short premise to the game, Sebastian Castellanos must once again confront unspeakable horrors within the nightmare born from the infamous STEM. This time, however, Sebastian’s mission is personal: He’s searching for his daughter Lily, who he thought he had lost many years ago, and it’s now a race against time as the world crumbles around him. With that said, the narrative of the game is well done and it makes it so that you feel the anguish that the character goes through on his journey to rescue his daughter. It’s well implemented, and if you’re a fan of a fairly good story within a survival horror game, The Evil Within 2 delivers. Sure the dialog ain’t excellent and it may feel a bit campy and cringy at times but overall, the plot and overall story works. Playing the first game is not a necessity to enjoy this latest installment, but fans of part 1 will definitely enjoy the references sprinkled in this sequel. Part of what makes The Evil Within 2 such a fun play is that apart from the narrative, the game does well to give the players an atmosphere that feels scary and unknown. The levels are larger and more open, with more places to explore and personalities to encounter (which we’ll get to later), and each place has a very drastic artistic shift from each other that adds to the immersion factor. This provides the players with a greater sense of uneasiness, since you’ll never know what is there to meet you beyond that door or across the dimly lit hallway. I personally felt that this was lacking, or at least not properly done in the first game, so you can just imagine my face in sheer terror as I was playing though The Evil Within 2 during the wee hours of the morning. It’s not often that this is done well in a game, and when it is, the experience is totally worth the playthrough. I know I’m not the only one who played the older Resident Evil games conserving as much ammo as I could, using the pistol as much as I can so I can keep my shotgun for those hard to kill baddies, and then finally finish the game with too much ammo! Well in The Evil Within 2, the scarcity of ammo is real but I felt that the level design allowed me to think my way through the game, rather than just enter a room guns blazing. In the end, same as Resident Evil, I found myself swimming in ammo once again but the way I got to it was extremely satisfying since getting there was a challenge in itself. As you journey through the gorgeous looking environments in the game, you will find yourself picking up a lot of crafting items that you can use at workbenches scattered around the world. You may also choose to craft items on the fly but since the resources in the game do not grow on trees, you’ll only want to use this as a last resource since crafting outside of the workbenches will use up more supplies than usual. 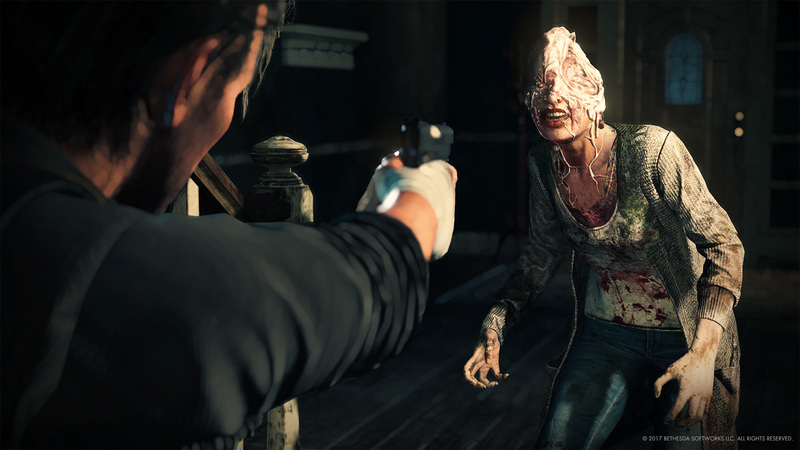 Again, we go back to that aspect of how The Evil Within 2 gives the players different ways to approach the game, rather than restricting them to a specific route or way of playing. (Semi) Open world exploration and survival horror do not mix but somehow, The Evil Within 2 conjures up some type of magic that makes it part of what makes the game good. There’s a certain hint of exploration to it, giving you a number of large levels to move around in, and there are moments that require you to even backtrack a bit to progress further. Jumping from place to place feels different as well since the environments are so distinct from each other, making every trip feel like a fresh one time and time again. Exploring every nook and cranny rewards you with much needed crafting materials and ammo and with these large maps comes side quests that you can see and track via a communicator of sorts that you have along with you. This, in my opinion, is the biggest factor that stands out in The Evil Within 2 and through my numerous times walking down Union (the main city in the game), new and exciting things pop up such as random screams and encounters here and there that make the trip that much more exciting. On the downside, while the game gets it done on so many levels, they might have forgotten to put some work on the character models and animation. This may be a personal preference, but I feel that some level of polish is lacking with the character animations, specifically Sebastian. It’s worse when you think about it since he is the main character and you’ll effectively see him slouch and walk weird for the whole game. Gameplay is not as frustrating as the first but is more exhilarating this time around. The open world addition is GREAT and it is the cornerstone for what The Evil Within 2 is all about. The feeling of survival horror is alive and well in this game. Difficulty levels are forgiving, but people looking for a challenge won’t be disappointed. Character models feel stiff and not well animated. It’s minor, but seeing Sebastian walk and run funny for the whole game may bother you a bit. There are outrageously themed set pieces in the game, maybe TOO outrageous for some. The Evil Within 2 is a great leap from its predecessor. With so many issues from the first, it was great to see Bethesda and Tango Gameworks iron out all of the kinks and deliver what is a superb follow up to a franchise that shows a lot of potential. Survival horror has a limited number of games that can give you a solid experience and with this outing, we’re glad to say that you can add The Evil Within 2 to the list, making it the perfect game to play if you’ve ever wanted to take a dip into the franchise. The Evil Within 2 is out now for the PC, Xbox, and Sony Playstation 4 and if you haven’t gotten around to playing it, well then give yourselves an advanced Halloween gift and strap yourselves in for a scare because this game is sure to make you shiver! While you’re at it, check out Maria Ozawa herself as she plays The Evil Within with the boys from Ungeek! *The Evil Within 2 review was played on a Sony Playstation 4 through a review code. The Evil Within 2 is a great leap from its predecessor. With so many issues from the first, it was great to see Bethesda and Tango Gameworks iron out all of the kinks and deliver what is a superb follow up to a franchise that shows a lot of potential. Survival horror has a limited number of games that can give you a solid experience and with this outing, we're glad to say that you can add The Evil Within 2 to the list, making it the perfect game to play if you've ever wanted to take a dip into the franchise. Previous articleOfficial Han Solo film finally given a title!